Our friends at Alive Studios are changing the way pre-kindergarten and elementary students develop reading and math skills. Using this series of powerful augmented reality learning tools, students will engage more, learn more, and retain more of the key concepts they are learning in the classroom! The mission at Alive Studios is to equip teachers with engaging solutions that help young students become proficient in reading and math by third grade. Their products are the first of their kind to utilize augmented reality within a full-year curriculum. Kaplan is proud to partner with Alive Studios to bring these new augmented reality tools into PreK and elementary classrooms. This story COMES ALIVE with Augmented Reality! 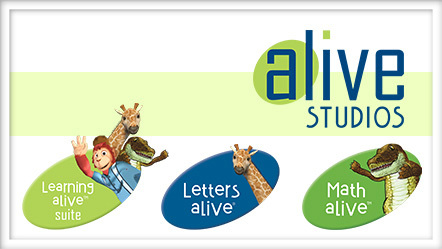 Alive Studios is introducing their first published book in a series of 26 short stories featuring the lovable animals from Letters alive® and Math alive®. Amos Alligator Arrives at the Airport is a fun interactive story that springs to life via augmented reality (3D) when used in combination with a free downloadable app. Amos and all his friends will appear on your smart device and interact with your young reader as he/she touches the screen. This book is perfect for the classroom and at-home story time. Several games and activities are included in the story that create opportunities to engage parents in their child's reading experience. Learn sounds represented by the letter "A"
These journals will help early learners master the 26 letters of the English alphabet. The FREE mobile app helps these journals come alive in 3D (augmented reality) for an engaging and interactive experience in the classroom or at home! Early learners now have a fun way to demonstrate their growing understanding of upper and lowercase letters and letter sounds. 2 - 8 years. These rugs come alive! Colorful classroom floor rugs are great for introducing children to the alphabet using sight and music. Just scan the rug with your mobile phone or tablet using the free mobile app, and children can sing along to the Zoo Crew Alphabet Music Video. Children will meet the 26 Zoo Crew alphabet animals and learn about uppercase and lowercase letters. Rugs are perfect for whole group and center time activities and encourage you to create your own fun rug activities. These durable rugs are made from 100% nylon and meet or exceed Class One fire ratings. Rugs are Green Label Plus certified and come with a useful lifetime-wear warranty. Choose size. Dr. Tamara Ogletree, Associate Professor of Reading at the University of West Georgia, recently conducted an independent study on improved student outcomes as a result of using the Letters alive™ program. Greg Smedley-Warren, Kindergarten Teacher at JE Moss Elementary in Nashville, TN has integrated augmented reality into his curriculum through the Alive Studios Program. To read the complete case study, click here. Lorena Falasco Elementary's motto is "Learning Is for Everyone." To engage students who may not have technology at home, the school's kindergarten teachers work with Letters alive, a supplemental reading curriculum that utilizes augmented reality. To read the complete case study, click here. Herman Lawson Early Childhood Center in McKinney, Texas is more than a daycare. Through Head Start, Early Head Start, and other preschool programs, the center partners with families to foster each child's potential as a lifelong learner. To support studentes in reaching their full potential, their Preschool Program for Children with Disabilities (PPCD) teaches vital early reading skills using Letters alive. To read the complete case study, click here.